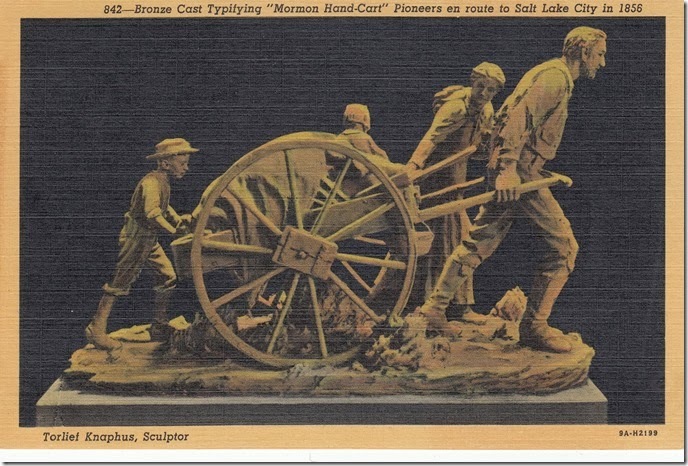 Marian Bulford wrote this article about her connections over the years to the Mormons, starting with her grandfather’s letters, her ‘pioneer’ ancestors crossing the plains, plural marriages and her most recent visit to Salt Lake City. My family history includes, like most peoples’ history, twists and turns and coincidences that sometimes defy belief. In the 1970’s, my family and I were living in Geneva, Switzerland, when we had a visit from the ‘Mormons’ doing their proselytizing door to door. Because we were in a non-English speaking environment and they were from the USA, we invited them in. Over the course of a few months, we became great friends and we decided to explore the church’s history with them. One day, whilst talking to them, they mentioned Salt Lake City as the ‘Zion’ of the church, and how the early Pioneers who had left their homes and families to trek across the US to get to Salt Lake City, Utah. That name Salt Lake City, brought back a memory. When I was 11 years old, I lived with my Grandparents for a few years and my Grandfather used to ask me to go to the post office to post his letter to a Salt Lake City address. I remember it so well, because in the 1950’s Air Mail letters were treated differently from normal mail, and I had to have this important missive weighed and stamped before it could be posted, so it made quite an impression. I remember thinking ‘where was Salt Lake City, and why and who was my Grandfather writing too? Of course by the time I arrived home again, the questions were forgotten. Now, years later in the 1970’s the question arose again, so I called my Grandfather and asked him about the letters and to whom he had been writing. He replied that ‘Well, you know the Americans, they are always doing their genealogy and one day, I received this letter from a lady, telling me I was related to her, I was a distant third cousin’ I questioned him further and he said they had corresponded for a number of years, and at one point, she had sent him a ‘Family Tree’ all handwritten of course and started in 1717 to my grandfather’s day. I was very excited by this and asked him, if, when we next came home could I see the ‘family Tree and read the letters. He replied that I could have the letters and the Family Tree, he had no further use for them, and he would post them to me. I think that started my interest in genealogy and research. The next time I went ‘home’ I questioned my grandparents and family at length, recorded their voices and wrote out names and birth dates of the family. My Grandparents – who threw nothing out – gave me some marvelous 1800’s photos of family members. On the back I wrote who these people were, most important, because shortly after that, we moved to Canada, and genealogy was put on the back burner in a box, for a number of years. 32 years later a renewed interest came, when we met some UK friends again, and members of the Church of Latter- Day-Saint or Mormons. We talked about genealogy, but with young families and busy lives, that was all we did, talked about it, but ,never really did any more research. About 8 years ago, we decided the time had come, and we met and researched together. Our friends invited us to their church’s’ “Centre of Family History” in LaSalle, Quebec, to do some real research with them. I found the Family History Centre a wonderful place. Free to anyone at certain times it has most of the current genealogy web sites online open for free. Books, micro fiche and copies of records can be researched, with help from church members if needed. It was a quiet peaceful place and we got to spend some time with friends, have lunch and do some family history together. Our friends were a great help, as the Church recommends that its members do family history so they are very experienced. I recalled all the information I had amassed in the 1970’s and had no idea how to put it all together. Now I had a chance to do that. I was pleased at how I had named all the photos as it was a wonderful tool to enable me to search online for family members. I decided to start with the mysterious ‘Family Tree’ from the USA. It was so exciting to be able to put in full names, birth dates and areas to search. I was grateful to the previous Missionaries that advised us to label and date all information as we received it. A really great tip! My Grandfather was born in Pembroke Dock, Wales and his Great-Grandfather had, as was usual, a large family. Two of those sons, my Grandfathers’ Uncles, Thomas and Samuel became Mormons and left Wales for ‘Zion’ Salt Lake City in 1854. That was a surprise for me, considering the friends and interest I have had in the church over the years, a case of my Great Uncles having “been there, done that’ so I was able to trace their long and arduous journey across the plains to Utah through Mormon church records. Our friends were very excited for us, as this was a great honour in the history of the church, to have family that had made the arduous and terrible trip to reach their ‘Zion’. Through the Welsh Mormon History page, I found that Thomas, was born in Wales in 1824 and he joined the Mormon church when he was 13 years old. Eight years later, he began to preach the gospel in England then Italy, France and Germany. Later, he went to Norway and Denmark. In Malta, he raised up a church branch. In 1854 Thomas emigrated to the US. The ship stopped in New Brunswick, Canada and picked up another family. Thomas joined that family and met Louisa. They continued the journey on their way to St. Louis Missouri to pick up supplies, wagons, food, and animals for the three month journey across the plains of the United States. In June at Fort Leavenworth, Kansas Thomas and Louisa were married. During that journey, with her brother Albert and her sister Martha, Louisa died of cholera, and was buried en route to Salt Lake City on the plains, in an unmarked grave, a bride of three weeks. Thomas continued on with the family, and arrived in Salt Lake City September 1854. In October 1854, Thomas married Louisa’s sister, Martha. Five children were born to Thomas and Martha. In 1857 Thomas married Carolyn and had 9 children with her. In 1864 Thomas married Ruth and they had 14 children together.The women and children, according to Censuses of the time, lived together in separate houses, and were called ‘Housekeepers” Thomas lived with Martha and their children. Altogether Thomas had 28 children and yes, my Great Grand Uncle had ‘plural marriages’! At that time, it was a tenet of the Church. Martha died in 1887 and a year after her death Thomas was sentenced to the Utah penitentiary for 11 months for ‘Unlawful cohabitation. He was sentenced a second time a year later, and served from April to August, 1890. Following a revelation to the church Prophet, the practice of plural marriage was instituted among Church members in the early 1840s however; from the 1860s to the 1880s, the United States government passed laws to make this religious practice illegal. These laws were eventually upheld by the U.S. Supreme Court. At that time, the President of the church, Wilford Woodruff issued a Manifesto, which was accepted by the Church as authoritative and binding on October 6, 1890. This led to the end of the practice of plural marriage in the Church. 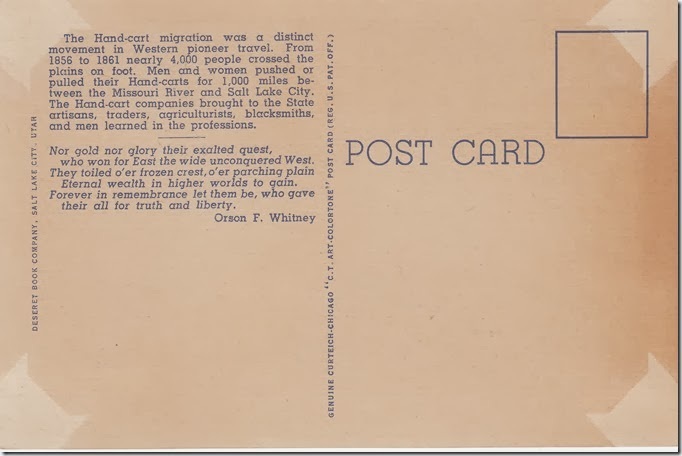 My Great Grand Uncle was asked by the church to explore further land outside of Salt Lake City and to build other settlements, and so he moved his families to ‘Cache’ (secret) County and founded a small place called “Paradise’ just outside of Salt Lake City. Thomas homesteaded the site where the church farm is now located. Last year, I visited this small town. It was full of my ancestors. Even the local cafe knew the name of my Grandfather and his Uncles. The Paradise Cemetery was a beautiful place, calm and serene and I found my Uncles and their families. It may sound strange, but I ‘introduced’ myself to them, and told them of their ancestor who wrote to my Grandfather, all those years ago, and how I now ended up here, in Paradise. I hope to go back again one day. The cemetery contained all of the family who were ‘Pioneers’ and had crossed the plains to get to ‘Zion’ It was very moving to see my two Grand Uncles with special plates affixed to their memorial stones to indicate that they were original Pioneers. Great Grand Uncle Thomas died in Paradise, Utah on 21st October, 1899. Meanwhile, I continue my researching and find surprises every day. How ever did we manage without the internet? Being a book owned by the United Empire Loyalist’ Association of Canada, it cannot be taken out of the library. The following is an excerpt from this superb book by G. Elmore Reaman. It is a generally accepted point of view in Canada that Frenchmen have always been Roman Catholics and that Protestantism has had little or no reliationship with France. It has been further accepted that there was no connection between Protestant French and the exploration of Canada by the French. A careful study of both of these points of view will show that they are untenable. It may come as a surprise to learn that historians of this period state on good authority that, if it hadn’t been for the business enterprise of Huguenots in France and their desire to found a colony where they could remain loyal to the King of France and yet enjoy freedom of worship, it is doubtful if there would be many French in Canada today. Furthermore, it is quite possible that had the French allowed Huguenots to migrate to Canada in the seventeenth century, England would have stood a slim chance of conquering Canada. Such information does exist in authentic sources, but few persons in Europe or America—and that includes Canada—have any knowledge of it. French Roman Catholics have naturally advanced their point of view and Protestants have never thought it worth while to investigate it. Huguenot Societies in France, England, and the United States are not aware that from 1534 until 1633 Canada was practically Huguenot controlled nor do they know that many of the earliest settlers in Upper Canada (Ontario) were descendants of émigrés from France, some of whom first went to the British Isles, then to the United States, and finally to Ontario. G. Elmore Reaman (1889-1969) was born in Concord, Ontario, he received his education at the University of Toronto, McMaster University, Queen’s University, Cornell University. Dr. Reaman’s materials are found at the University of Waterloo Archives.